Expect to see the button on the BR site. These are great news! Thank you wholeheartedly. Cheers from the US, and best of luck! I'll be sure to donate what I can, and share this great website with everyone I know! What's your connection with Golden Dawn? I am a member of the Party. It would be nice if you could add a bar to show how much has been donated. True. But I am not aware how I can implement such function. 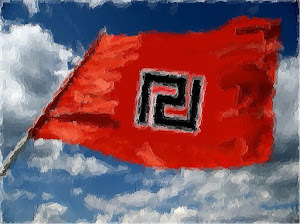 Remember to spread the link of this site, I google "Golden dawn" a few times a week, and everytime I find new article about Golden dawn or old ones, I write some comments and in every comment I put a link to this site. Haha, manually it is then. 1:39 I think I have seen your comments throughout the internet, and I would like to thank you. I would spread the link around, but there is no time for me to do it, as those translations take up a MAJOR portion of my free time. I have faith that the readers themselves will spread this Newsroom around, because it has a holier cause that just becoming popular. "1:39 I think I have seen your comments throughout the internet, and I would like to thank you." "I would spread the link around, but there is no time for me to do it, as those translations take up a MAJOR portion of my free time. I have faith that the readers themselves will spread this Newsroom around." Oh sorry, :) That comment was directed at all the other readers not you, I clicked "replay" to your comment by misstake. I mean everyone reading newsroom should take a few minutes everyday and google "Golden dawn" in english or their own language and post a few comment with a link to this newsroom on every article they find about Golden down. That way people actully interested in the truth can come here and learn about Golden dawn themselves, instead of relying on multiculti media. It is easy to write a general comment on Golden dawn, multiculti media mostly writes the same things all the time anyway, so people can write one comment and then copy it with the link to this newsroom on every article about Golden dawn over and over again, just takes a few min to post it on tones of newsites. Grecia fuerte! Saludos desde España. Arriba!! Visiting Athens soon,whats the address of the movements offices. 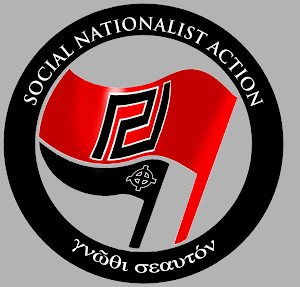 How can I make a Golden Dawn member, english speaking friend to exchange British papers with etc. You will have to contact the HQ yourselves. Tuesday, Wednesday & Saturday: 7:00 p.m. to 9:00 p.m. I have sent you an email further to my recent enquiry about the flags.Have you any news on this yet? I replied, twice in fact. Was there a problem with the emailing service?? 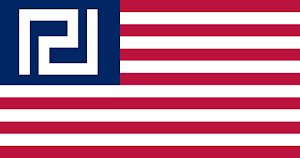 Anyways, I asked you how many flags you would need. What are the cost of flags and postage? I have not received your email sorry. If you can get me a cost per unit I will speak to the people involved and get back to you with an order. We could do with some Flags over in the UK for forthcoming battles with the scum marxists how about it. The flags cost 13 euros each flag, but i haven't checked the shipping costs. First let me know what the quantity is. Also, send my a mail when you can. I will send you another email. Could you reply to confirm receipt as the last communication seems to have failed. Will you be posting any articles showing where any donations you receive will be spent? It would be great to know that we are directly helping the Greek people via food parcels etc. If you are in America and near NYC you can donate canned goods to the Golden Dawn NYC headquarters. Does the money go-to GD or the News room? The Newsroom. Donations will help to add translators and also use a bigger part of my free time to keep translating. Could the newsroom also branch out... into an online store with golden dawn t-shirts? You would be investing the donation money into a business which would, over time, make more money than just receiving donations alone. Well, the donations aren't here for profit, I merely wish to be able to withstand this difficult situation as a Greek Worker, and to be able to donate to GD. GD is mostly funded by donations from its members. I like the idea of this online shop because it will further empower me and GD as well, financially and morally. Seeing as you have paypal set up an online shop would be easy to organise. These are the times that try men's souls. The harder the conflict, the more glorious the triumph. If you acquire enough funds, I'd highly recommend acquiring your own site out of blogspot. Using a 3rd party application for hosting, particularly blogspot, could lead to "unintended" problems with the systems all the way down to possible outright future ban. Keep up the good work Golden Dawn. You're an inspiration to nationalist movements all over Europe and it's great what you do. If only Britain would follow GD's example. I pray for the success of Golden Dawn. Greece for Greeks! Europe for Europeans! and the comment from my UK friend was 'do you think our saviour will come from Europe as our people appear to be brain dead?' I said yes. The GD is the only, and only option left to Greece and Greeks to regain their national sovereignty, preserve their identity and remain a Greek nation. In a globalized mish mash of nations,peoples,traditions and cultures being homogeneized by the blending apparatus, the GD is the vehicle for Greece's recovery and renaissance.